Abbey Boilers heating engineers are fully experienced and qualified in installation of all types of Cylinder systems. We operate in Horsham, West Sussex, Surrey and South West London. From the traditional open vented cylinder to the more commonly installed unvented cylinder, our qualified engineers are able to service and replace these with very little fuss. 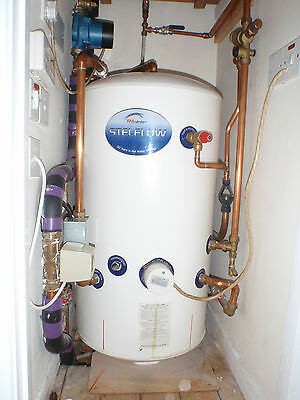 Due to the current building regulations you are no longer able to change a cylinder that is connect to a gravity fed supply without updating your system, although updating the system means the fitting of a motorized valve and cylinder thermostat this all could still be done in a day and only a temporary loss of your hot water supply. A traditional vented hot water cylinder. Unlike newer unvented tanks, these copper tanks are fed by cold water from a header tank (normally located in the loft) and they use gravity to drive the hot water around the home. 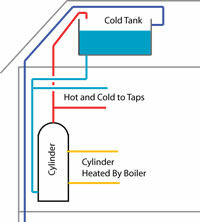 A vent pipe links the vented hot water cylinder and the cold water in the header tank. In an unvented system there is no cold-water tank – instead the sealed hot water cylinder is fed directly by the cold water mains. Since they are operating at mains pressure, they offer much better flow rates meaning your shower and bath performance should be higher.